These familiar stereo friends were first issued during the early 1960s. It is good to make their acquaintance afresh. Certainly they belong in any Szell hall of fame. Contrary to the image of Szell as forbidding authoritarian these performances smile and surge. They are also object lessons in the tight-leash schooling of an orchestra revelling in utterly secure technique even when pushed to ultima thule. Listen to the virtuosic quicksilver of the opening of the second and fourth movements of the Second Symphony; makes you hanker after a Szell Italian Symphony. The Szell-Cleveland smile is Mozartian at times - as at the opening of the Larghetto of The Spring and there is a touch of the Jupiter amid the closing bars of that symphony�s finale and also in the final Lebhaft of the Fourth at 5.19. The garrotte taut rapid shuddering strings at the start of the final movement of The Spring are remarkable. Szell avoids undue haste even in the Sostenuto assai of the Second Symphony. Here he is in fact two minutes slower than Barenboim in his justly acclaimed Teldec set (2564 61179-2, 2003). This is a deeply romantic reading. The Lebhaft of The Rhenish flies along with Mercury�s winged feet. Not once does the articulation falter or stutter. The metronomic regularity of the final Lebhaft of The Rhenish does not spell dull and the Cleveland brass impress at every turn especially in the tawny autumnal �breakers� at 2.30-2.48. The Fourth Symphony is of the same high standard with the muscular convulsions of strings and brass in the Lebhaft and Scherzo deeply satisfying and the stereo separation at its most artistically effective. The playing of violins and viola is pin-sharp in the Langsam and Lebhaft (CD2 tr. 9 3.58). The Manfred Overture is played as if driven by the Furies; this is the sort of treatment you imagine from Nikolai Golovanov. Szell must have made a feast out of, say, Weber�s Oberon Overture or Berlioz�s Le Corsair. Hearing his way with Manfred I wish Szell had recorded the Overture, Scherzo and Finale, Hermann and Dorothea and Julius Caesar. The transfers have been extremely well accomplished by Sony. Of course there is the pervasive low level hiss of analogue stock tape. With tapes this old the transparency and openness of sound we get from Barenboim on Teldec cannot be matched. However there is no congestion and everything is clear and registers well. There is plenty of competition and some of it is more sweetly recorded. I have compared the series by Kubelik (both Sony and DG-Eloquence) and Marriner (Capriccio and Brilliant). Kubelik on Sony offers playing that is affable, good mannered, modestly unassuming and well recorded. The performances are warm and rich, possibly a little laid-back; as much to do with the South German temperament as with Kubelik's perspective on Schumann. His Rhenish is grandly Brahmsian, stately in the Sehr mäßig and his French Horns roll and halloo as if through a mist of golden wine. Kubelik's early 1960s recordings with the Berlin Phil have yet greater vitality but the sound does not have the depth and breadth of colour found in the Sony or the Teldec. There is also Marriner with the Academy of St. Martin-in-the-Fields (Brilliant Classics but originally Capriccio) although his lickety-split élan gives the symphonies a decidedly Mendelssohn-like flight. If you seek even more fire in the belly then try Solti (Decca), the recently deceased Hans Vonk (EMI Red Line) or Sawallisch (EMI). I have heard parts of the Solti and Sawallisch sets in the past but must still go by favourable reports on the Vonk. Franz Konwitschny is also highly recommendable on Edel-Berlin Classics unless you have non-negotiable objections to mono. If you want up-to-the-minute sound quality then I suggest you track down the Barenboim set which is a leading contender in a field populated with strong versions. The Barenboim �stamp� yields readings that are flexible and instinct with teeming life. Teldec deliver an audio image that is one of the most realistic and vigorous I have come across. Solo �voices� are captured with admirable definition in the quieter moments while the Staatskapelle French horns seem underpinned with Wagner tubas such is their lustrous golden roar. The documentation of the Szell is well up to Sony UK exemplary standards with full discographical information as well as an engagingly pugnacious essay by Szell written in 1960. The two CDs are in a convenient single width case. 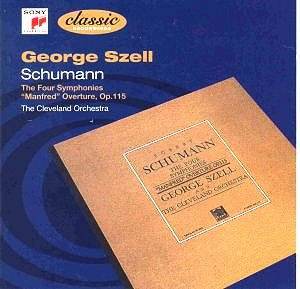 The Szell-Schumann is the sort of discovery that you will want to share with others. I think you will be very pleasurably surprised; all at twofer price as well.